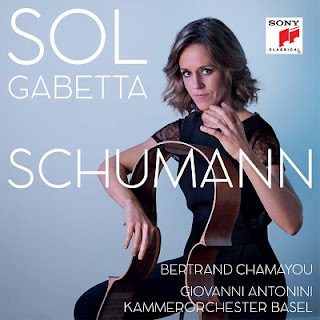 All is not what it seems with this new Schumann album from Sol Gabetta. From the cover, which shows Gabetta pretending to play on a set of disembodied cello ribs, the label, and Gabetta’s own stellar reputation, it would be fair to expect a vehicle for her star prowess. But this is a different kind of project, as is demonstrated by the liner, not an airy and self-serving interview with Gabetta, but a detailed discussion of Schumann’s cello music by Ruth Seiberts: The cellist doesn’t even get a bio. Even more surprisingly, these are period-instrument performances, or at least period-instrument accompaniments: Pianist Bertrand Chamayou plays a J. B. Streicher fortepiano, made in Vienna in 1847, and the Kammerorchester Basel—who, it seems, swing both ways—on this occasion play on gut strings and with period brass. 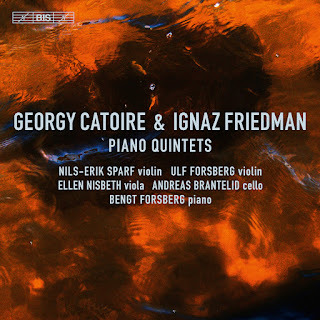 But someone forgot to tell Gabetta herself, whose penetrating tone in the chamber works suggests metal strings and who (thankfully) eschews the sweeping portamento that we increasingly associate with 19th-century performance practice. These are assertive performances from Gabetta, and they take some getting used to. The Five Pieces in Folk Style are a good place to start, because Gabetta is able to bring rhythmic focus, with her narrow tone and brusque articulation. The other cello and piano works, the Adagio and Allegro and Fantasiestück, require more lyrical playing, and Gabetta shows she can mellow her tone, but this is still a very up-front cello sound. Chamayou is a lively and alert accompanist, and the engineers find a good balance between the two instruments. The fortepiano sounds boxy in the mid-register but has an appealing depth in the lower range—so the period instrument is a mixed blessing here. The period instruments in the Basel orchestra make less of an impression in the concerto, although their playing, too, is suitably light and agile. Gabetta is on excellent form here, expanding her tonal palette to match the orchestra, while still retaining that focus of tone and line. 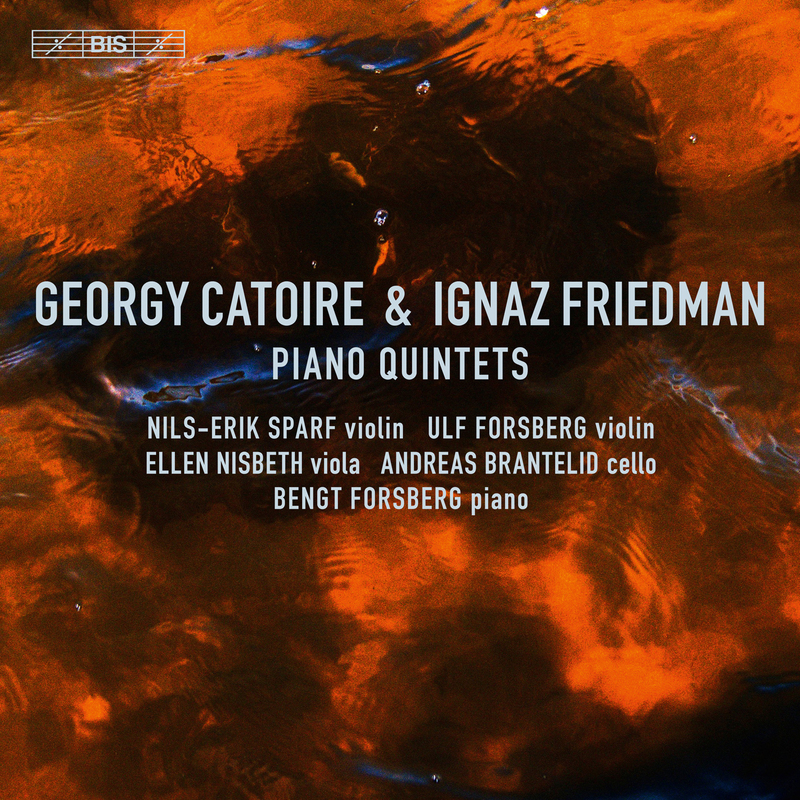 The concerto is clearly the main selling point for this disc, though its period credentials are of only marginal interest—and when you add in the boxy fortepiano, the result is an elegant but curious album, with Gabetta’s distinctive playing only partially alleviating its underlying concept problem. This disc presents two attractive but largely forgettable piano quintets of the late Romantic era. Neither composer is particularly famous—at least as a composer; Ignaz Friedman had a more compelling claim to fame—but their piano quintets seem to be considered their finest works. So this recording offers an intriguing taster of their respective soundworlds. And, despite hailing from different countries, Catoire from Russia, Friedman from Poland, their styles are remarkably similar, making for a logical and complementary pairing. Georgy Catoire (1861–1926) was as Russian composer (of French descent, hence the name) working in the same milieu as Taneyev, Glière and the young Rachmaninoff. But Catoire was largely self-taught, and isolated himself from cosmopolitan musical life, at least until 1915, when he was appointed Professor of Composition at the Moscow Conservatoire. As with many composers working in Moscow in the years immediately before the Revolution, Catoire sounds a lot like Rachmaninoff, but without the memorable tunes. So in the Piano Quintet, we hear deeply sighing melodies in the strings, with just a touch of folk flavor, supported by rippling waves of arpeggiated accompaniment in the piano. Catoire’s development techniques are more distinctive than his melodies, and the opening of the first movement bears a striking resemblance to the Tchaikovsky Piano Trio. But he soon goes his own way, with densely contrapuntal and harmonically complex elaboration, reminiscent of Taneyev but less focused and directed. The results feel structurally loose, as if the form of each movement is an afterthought, an impression supported by the casual and relaxed ending to each of the three movements. If Catoire begins with Rachmaninoff, Friedman begins with Brahms, his quintet opening with a three-note motif taken from the Scherzo of Brahms’s Third Piano Quartet, with which it shares the key of C Minor. Catoire’s rambling movements seem positively concise compared to Friedman’s—whose quintet, also in three movements, is almost half as long again. Friedman is more dour than Catoire, more serious and intense. The Larghetto second movement offers some relief, with delicate and varied melodic textures from the string quartet supported by more modest textures in the piano. The last movement is titled Epilogue, but it is just as knotty and involved as the first. Given Friedman’s itinerant career as a concert pianist, it is little surprise that the stylistic profile of his music is complex and variegated. The Piano Quintet dates from 1918 (three years after Catoire’s), soon after Friedman’s studies in Leipzig with Hugo Riemann and Berlin with Busoni. Certainly, the approach to development and counterpoint feels Germanic, even if the rhapsodic form suggests a distance from those traditions. Of the two, the Catoire comes across as the more accomplished work: Neither is a lost masterpiece, but both are distinctive enough to be worth hearing. These recordings were made at the Allhelgonakyrkan, a church in Stockholm that also hosts a chamber music festival, led by Bengt Forsberg, the pianist here. He seems to be the motivating force behind the project, although the most famous name amongst the players is cellist Andreas Brantelid. All of the players are up to the demands of this music, although the extended climax of the Friedman first movement taxes the violin intonation in the upper register. The recording quality is up to BIS’s usually high standards. Both works, and the Friedman in particular, pose challenges of balance, and the engineers seem to have recessed the piano to prevent its huge textures from the dominating the ensemble. The strings, by contrast, are very close, and we hear the players breathing in silences, and some extraneous bow noise, though none of it a distraction to this adventurous and frequently beguiling program. This review appears in Fanfare magazine issue 42:6. We don’t usually think of Pfitzner as a Lieder composer, but he was prolific in the form, writing 115 songs, spanning his career. This disc is Volume 2 in a new complete cycle from Naxos, which should eventually run to five volumes in total. Colin Blazer sings the Lieder for tenor voice, covering the period 1888–1916, so early-to-mid career, and Naxos are wise to present most of the program in chronological order, as we hear a clear evolution from a generic Brahmsian approach early on to a more distinctive sound around the time of Palestrina, an opera that several of these songs anticipate. Pfitzner’s texts are mostly from German poets of the late Romantic era who have otherwise fallen into obscurity—August Schnezler, Robert Reinick, James Grun—although Eichendorff, Heine, and Goethe also make appearances. And, in contrast to the colorful tone painting and evocative scene setting of his operas, the approach here is more text-focused, especially in the early songs, generously melodic but always placing the texts above the musical invention. But more sophisticated harmonic progressions and accompanying effects begin to creep in in the first years of the 20th century, with the Eichendorff setting “Die Nachtigallen” (1907) a particularly distinctive and piquant number. Tenor Colin Blazer is more associated with the Baroque repertoire than the late Romantic, but he has a fine voice that suits this music. His tone is light but impressively agile. 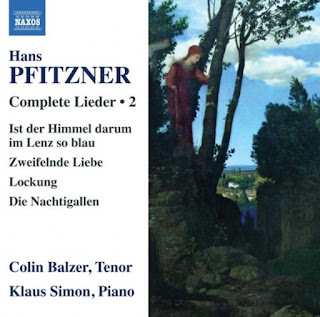 Pfitzner occasionally makes Wagnerian demands, especially with loud and high phrase endings, and Blazer sometimes struggles, although he is able to add a carefully controlled vibrato to stabilize these passages. His German diction is good, with satisfyingly rolled “r”s, although “ch” sounds could be softer. Pianist Klaus Simon doesn’t overplay the generally conservative accompaniments, and balances between singer and accompanist are good. The piano itself could do with more tonal focus, especially in the mid-range, and the reverberant but boxy acoustic of the Steinhalle in Emmendingen does it no favors. This release, and indeed this entire cycle, is up against a five-volume set of the complete Pfitzner Lieder released on CPO in the late 1990s. The tenor for those recordings was Christopher Prégardien, who has a fuller and lower voice than Blazer, though he is more strident and commanding in those high-lying phrase endings. When that cycle was complete, CPO boxed them up as the five-CD set 999-789-2. That is still in print, and available at mid-price, so the chances are that Naxos will eventually come up with a comparable and similarly priced offering. CPO look to maintain the lead here, but given the differences in approach between the recordings of the tenor songs, it might well end up that both are worth having. Period instrument recordings are often accused, or at least suspected, of academic rather than musical motivations. But the two need not be mutually exclusive, as this studiously academic but also vibrantly musical collection demonstrates. 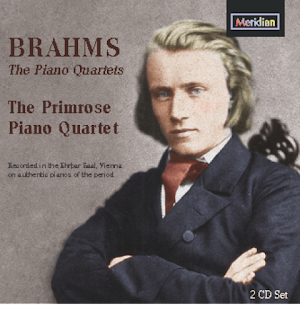 The three Brahms piano quartets are here presented in period performances—the first ever it seems for Nos. 2 and 3—using three different pianos of the era, and recorded in a venue familiar to Brahms himself, the Ehrbar Saal in Vienna. The recording grew out of a symposium at the Royal Birmingham Conservatoire on period performance practice. The Conservatoire also sponsored the release, and so, as expected, the documentation is impeccable, with detailed discussion on the works, the performance philosophy, and the pianos, by John Thwaites, who is the Quartet’s pianist, and Gerd Hecher. The three pianos are an 1870 Streicher (Quartet No. 1), an 1853 Blüthner (No. 2), and an 1878 Ehrbar (No. 3). Of the three, only the Ehrbar is cross-strung, and it sounds the most modern. The Blüthner is the most wooly sounding, while the Streicher has a nimble action and clear tone that makes it the most attractive and distinctive, at least to my ear. But soft, round sounds are the order of the day, and the gut strings of the other three players—Susanne Stanzeleit, violin; Dorothea Vogel, viola; Andrew Fuller, cello—give an ensemble sound that is fully sympathetic to each piano in turn. The gut strings are particularly apparent in Brahms’s regular use of percussive pizzicato patterns, here given a warm bronzed quality, but without reducing the rhythmic drive. Another contentious issue is portamento, in which the Spencer Dyke Quartet are apparently indulgent. The First Piano Quartet appeared on a period performance recording in 2016, from the Australian ensemble Ironwood (ABC 481 4686). They take portamento to extremes, and the results are uncomfortably queezy, whatever the historical veracity. The Primrose Quartet apply portamento too, but it’s more reserved, as Thwaites writes, “... an unashamedly modern players’ perspective on the refined portamenti of Arnold Rosé, concertmaster of the Vienna Philharmonic from 1881 (and rumoured to be an earlier owner of Susanne Stanzeleit’s Guadagnini violin).” Piano arpeggiation—a subject of much discussion in 19th-century period practice—is rare on the NGS recording, as it is here. More interestingly, the parts occasionally move out of alignment in that early recording, a practice that the Primrose Quartet aims to follow. So we often hear a piano chord slightly before the sustained bloom of the string trio, but the effect is made more palatable by the generally mellow attack from each of the pianos. The Ehrbar Saal gives a warm resonance to the sound, and perhaps more body to the pianos than they might otherwise achieve. In line with its scholarly credentials, the recording is made in what is described as “Natural Sound.” It isn’t clear exactly what that means—some sort of binaural approach perhaps?—but the result is a marked separation of the string trio in the stereo array, with the cello dominating the right speaker. The pianos are well recorded though, without any of the mechanics impinging on the sound.